This is MKT's first movie after his release from jail. A few months after his release, India had won independence. There was a fervour of deep country spirit and patriotism all over the nation as the people looked forward towards the future of the free land with great expectations. They looked towards the leaders who won the freedom with gratitude and reverence. At that time, all the leading singers gave gramaphone records of patriotic songs. MKT too gave a set of four songs namely 'Gandhiyai pol', 'Kaimaru seivathundo','Paarukulle nalla nadu' and 'Suthanthira kodi'. These songs were sold in thousands. After a long period of imprisonment, MKT was reluctant to shoot Rajamukthi in the Madras Presidency. He decided to shift his production unit and artistes to Poona to shoot his film at Prabhat studios. To house all the members of the unit and artists, MKT rented a very big bungalow and purchased costly wooden furnitures for their use. He also took with him a cook amongst his crew. Apart from MKT, Serugalathur Sama, P.Banumathy(well known as Paavuramaa Banumathy) and V.N.Janaki (who later married M.G.R) act in this film. 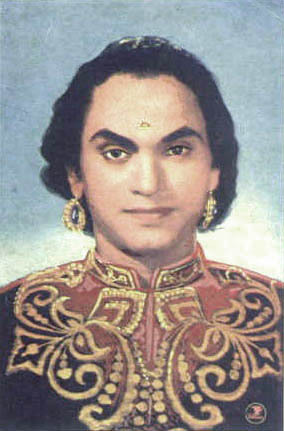 V.N.Janaki was the daughter of Sri Rajagopala Iyer, who was the brother of the great Papanasam Sivan. M.G.Ramachandran and his brother, M.G.Chakrapani, P.S.Veerappa(who makes his debut in this film), P.G.Venkatesan and C.T.Rajakantham also feature in this film. MKT introduced MLV to film music through this film. This film has some of the less known but wonderful songs by MKT such as 'Suprabatham' in Naatai,'Manam ninaindenginene' in Kambothi, 'Ennaanandam' with MLV in Simendramadhyamam, 'Unai allal' in Saaramathi,'Nee palli ezhundal' in Boopalam, 'Pongum Anbar' in Ragamaliga (Bilahari, Purvikalyani, Mohanam, Madhyamavathi and Sindu bhairavi), 'Manida jenmam' in Kamas, 'Piravi kadal' in Chenchuruti and 'Ingum Angum' with MLV in Madhyamavati. MKT and Banumathy have sung a duet song in this film. 'Kulakkodi thazhikka' by MLV in Ramapriya and 'Indrajala vithaikkaran' in Jonpuri by Serugalathur Sama became quite popular. 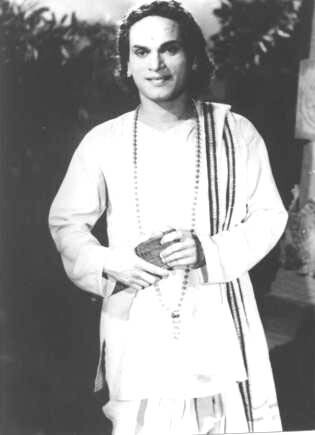 T.N.Rajarathnam pillai plays nadaswaram in this film for about ten minutes. 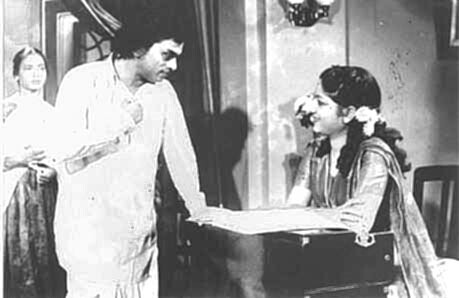 Pudumaipittan, as the dialogue writer, was introduced in this film. Despite very good songs by Papanasam Sivan and good starcast, the film had only an average run. This was purely because the film was abnormally lengthy which resulted in a lack of tempo and there was no comedy part to reduce the drag. Two incidents that happened during the shooting of this film are worth narrating here. P.Banumathy was accompanied by her husband, Ramakrishna and her son Master Barani. Master Barani used to visit the studio regularly to listen to the recording of the songs and the orchestration. He liked the violin very much. He used to move his hand beautifully to the tunes as if he was really playing a violin. One day MKT happened to see this and was impressed with the boy's deep interest in the instrument. To everybody's surprise, MKT bought a new violin and presented it to Master Barani. The next incident was when Gandhiji was assasinated. The shocking news spread like a wild fire and all the shops and restaurants were closed for three days. MKT enquired the cook about the stock of food grains, vegetables etc on hand. The cook informed him that he had sufficient stock of everything except firewood. MKT, without the least hesitation, ordered the cook to dismantle the teakwood furnitures in case of need to avoid shortage of firewood ! During the making of this movie, MKT used to visit Pandharpur quite often to have darshan of Lord Krishna. At the time of making Rajamukthi, MKT lost his beloved mother. MKT had great respect towards his mother and infact purchased all the properties in her name. 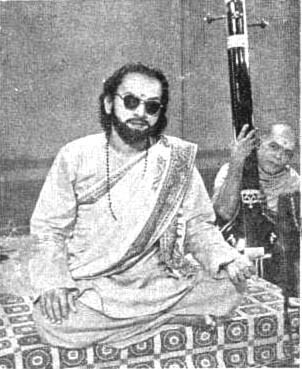 M.G.R's guru in stageplays) and K.A. 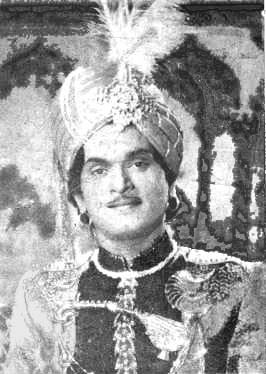 Thangavelu, who was introduced in this film. 'Thaalpanindu' in kharaharapriya,'Uyirgalellam Inbamay' in Gowrimanohari, 'Ellam Inbame' in Atana,'Vinpola neela niram' in Ragamalika(Kambodhi and Simendramadhyamam), Vetrilai podamale in Ragamalika(Mohanam and Antholika) and 'Oru pizhai' in Ketharagowla sung by MKT were set in classical carnatic ragas. But 'Sevai seydale kaanalaam', 'Chedi maraivile', 'Yanai thantham poley', 'Konji pesum kiliye' and 'Pudiya vazhvu peruvom' which were set in light music also became popular due the change in the trend of film music. 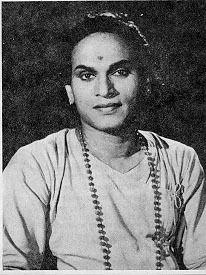 Suratha was introduced in this picture as the lyricist. While MKT features in this film as a god fearing man, NSK's comedy centers around spreading a state of social awakening among the people. This film also had an average run only. Some producers from Andhra wanted to produce a tamil film featuring MKT. 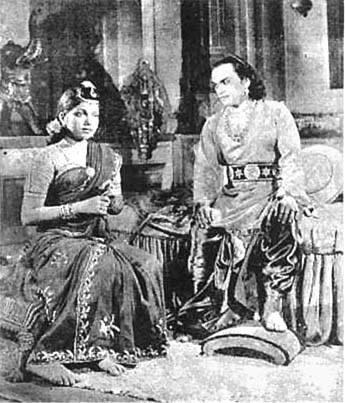 They produced Syamala in 1953 with MKT in the lead role. MKT and S.S.Koko were the only tamilians in this film. Rest of them were all from Andhra. Popular among them were Relangi and S.Varalakshmi. MKT for the first and last time in his life acted with a moustache and resembled very much the famous telugu screen hero, A.Nageswara rao! 'Kalaingyanin Kaiduri' in ragamalika (Natakurinji, Shanmugapriya and Sama), 'Rajan Maharajan' in Useni and 'Kannukkor virundagi' in Sahana were set in classical carnatic ragas. 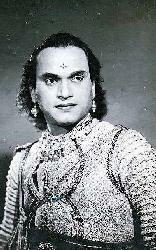 'Rajan Maharajan' became very popular. Veena vidwan Raghavan plays the veena in this song. MKT was very particular that his name should also be mentioned in the gramaphone record. The recording company obliged to MKT's request and for the first time a background artiste's name was also mentioned alongwith the singer's. 'Thaye sankari' in Ragamalika( Durga, Saraswathi and Neelambari), 'Amba Adi parasakthi' by MLV in Ragamalika (Senchurutti, Vasantha, Kamas, Bilahari and Kethara gowla) also became popular. It is not known whether this picture was also produced in telugu. Despite good music, this film also failed in the box office. MKT's next film Puduvazhvu was his own film under the banner of 'Sarvodaya films'. The story is quite similar to Haridas. Apart from MKT, NSK, T.A.Madhuram, K.A.Thangavelu, T.S.Balaiah, P.B.Rangachari, Maduri Devi, Lalitha, Padmini, Alwar Kuppusamy and T.S.Durairaj feature in the film. Kharaharapriya, 'Appa Nan Venduthal' (Virutham), 'Unmai Ondre pesum' in Charukesi, 'Deviye kann paramma' in Devamanohari (with swaram), 'Chutum Vizhi sudar thaan', 'Yarai nondu kolvadu' in Panthuvarali, 'Vanjakar seigai' in Sivapriya, 'Annayum thandayum' in Ragamalika ( Mukhari, Neelambari and Sriragam), 'Then kuyil pole' in Yaman kalyani and a good thillana piece, the film failed to attract the masses. Sivakami was MKT's last movie. This picture was released after the demise of MKT on 1.11.59. With the reliable information then available, the producer wanted to include as many incidents that had happened in the real life of MKT as possible. But he could not do it due to the sudden demise of MKT. MKT features only in a very few scenes. MKT plays Bhagavathar himself in this movie. Many dialogues in the film relate to the real life of MKT. The then famous telugu star Jaggayya has acted in this film as the hero. Another telugu artiste to appear in this film is G.Varalakshmi. S.D.Subbalakshmi, the stage partner of MKT during the 1920's and 30's, also appears in this film in a few scenes. vediyan' in Anandabairavi and 'Aravabharanan' in Ragamaliga(Kanada, Kapi and Mohanam) find a place in the movie. The other songs which were released as gramaphone records are 'Umayorbaagane' in naattai, 'Thillaiyin nayakane' in ragamalika(Sindhu bhairavi, Sama and Boopalam) and 'Deiva kanaka sabhai'. 'Sotrunai vethiyan'. In 'Sotrunai Vediyan', an old man garlands the radio set through which the broadcast of the song is heard. In 'Arputha leelaigalai', people from all walks of life are found spellbound as they listen to the reverberating music that comes flowing through the air from Bhagavathar's house. Carried away by the elevating music, a milkman pours the milk on the ground rather than the vessel while the housewife is equally not aware of what he is doing. These scenes are far from exaggerations. We still find ardent MKT fans in many parts of Tamilnadu who deeply cherish the memory of their favorite singer. The man will live in his songs forever.